How’d One Hour Tees get into the Wrestling Business? In the Summer of 2010, the owner, Ryan, got an email from Scott Colton. He said, “Not sure if you’re familiar with me, but I’m a wrestler named Colt Cabana and I have a friend named CM Punk who is in WWE that needs a shirt to wear on tv that says, I Broke Big Show's Hand.” Ryan, who opened One Hour Tees in 2008, a custom t-shirt design shop in Chicago, had been a life-long wrestling fan. They came by, had CM Punk sign a shirt, took some pics and they left. Colt emailed Ryan some time after asking about printing up some “I Star Colt” t-shirts for him. He told Ryan he just started this new podcast (now known as "The Art of Wrestling") and in exchange for making him some free shirts, he would make us “the go-to place for wrestling t-shirts”.....BOOM! We run a custom t-shirt shop in Chicago. We print for over 800 schools nationwide, 1000's of businesses and do tons of one-off gifts at our retail store. Since launching ProWrestling Tees.com, we now employ 30 full-time staff members. Majority of them are life-long wrestling fans which gives us consumer knowledge to helps us provide you with the best wrestling t-shirts on the planet. Here at ProWrestlingTees.com we work directly with some of the greatest wrestlers in history. By allowing wrestlers to create their own stores it gives you, the fans, the opportunity to own t-shirts you have seen at shows, in pictures or may have never seen before. All stores are owned by the wrestlers themselves. Profits go directly to the wrestlers to support what they do & what you love. We are currently located on the north side of Chicago. Our address is 2348 North Damen Avenue near the Damen/Fullerton intersection of the Bucktown neighborhood. Non-metered street parking is available right near our store down Damen Avenue. 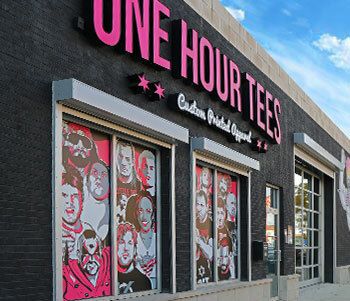 Our store is directly connected to the One Hour Tees print shop, which allows to restock apparel instantly after it's been sold.